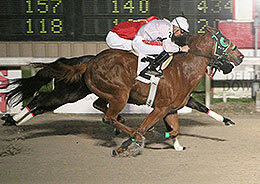 Jmf Dashing (#2) gets ahead of Ardor (#1) in the last of four trials Friday night for the Old South Derby at Delta Downs. VINTON, LA�APRIL 21, 2017�Only head separated Jmf Dashing and Ardor as the pair of 3-year-olds raced to the top two qualifying spots in the Old South Futurity trials Friday night at Delta Downs. The 10 fastest qualifiers will return on Friday, May12 to vie for the winners' share of a $62,715 purse over 350 yards. Graded stakes-placed Ardor races for owner J F Racing Farm, LLC and trainer Jose Sanchez. Ridden by Manuel Gutierrez the Texas-bred son of multiple stakes sire IVORY JAMES recorded the second fastest clocking of :17.519 seconds, a 94-speed index. Bred by Bobby Cox, from the First Down Dash mare First Fervor, Ardor has compiled a (8) 3-1-1 record and banked $34,130. The brown gelding was third in the Grade 3 Harrah's Futurity at Louisiana Downs last season.